Twenty young people have been given a new award set up in memory of Diana, Princess of Wales. 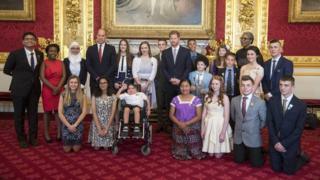 The Duke of Cambridge and Prince Harry presented the Legacy Awards to children and teenagers for creating positive social change in their communities. The recipients came from the UK, United States, Canada, India, Belize and the United Arab Emirates. The Duke paid tribute to his mother, saying she still inspires "countless acts of compassion and bravery". He and Prince Harry were making their first joint appearance at an event run by the Diana Award, established to promote their mother's belief in the positive power of young people. Award winners included a teenager from North Yorkshire who set up a swimming club for young people with disabilities. Jemima Browning, 16, who started Tadcaster Stingrays, was inspired by her brother Will, 14, who has Down's Syndrome. She said he often experienced barriers to competing in sport due to his disabilities and the additional support he requires. "It doesn't feel real, it feels really strange it feels like I don't deserve something amazing like this," she said. "To be able to stand in front of two amazing people who are recognized across the world is just a massive honour and I can't believe it really." The Duke of Cambridge said: "We are so glad our mothers name is being put to good use through The Diana Award." The winners were selected from a poll of nominations by an independent judging panel chaired by Dame Julia Cleverdon, founder of Step Up To Serve. The panel included Julia Samuel, Patron of Child Bereavement UK and friend of Princess Diana, and campaigner Baroness Lawrence OBE. Joshua Adams, 18, from Towester, Northamptonshire, who acted as carer to his mother, who has a complex mental health disorder, and two young siblings. Asha Parkinson, 17, from Bushey, Hertfordshire, who started a music project called Voices Beyond Divisions, aimed at bringing children together to sing for peace. Nicholas Nikiforou, 11, from Weston Super Mare, who was born with what is called a disfigurement to his face - a term which he disagrees with. He raises money for Great Ormond Street Hospital, where he has received treatment. Femi Owolade-Coombes, 11, from Lewisham, London, who was diagnosed with Tourette's syndrome aged seven. He is a talented coder and described as one of "tomorrow's engineers". Matthew White-Iley, 15, from Hartlepool, who is an anti-bullying ambassador and mentor. Brooke Taylor, 15, from Lostock, Bolton, who has raised thousands of pounds for the Royal Manchester Children's Hospital Charity, having been treated there since birth. Jonathan Bryan, from Stanton St Quintin, Wiltshire, who campaigns for people with disabilities. Garreth Browne, 16, from Shantallow, Derry, who despite losing both his parents in the same year is described as "giving hope to everyone he meets". Dervla Dolan, 18, from Omagh, Co Tyrone, who set up the Enda Dolan Foundation after her brother was killed in a road accident in Belfast. Jonjo Heuerman, 15, from Wilmington, Kent, who raises money for the Bobby Moore Fund in memory of his Nan. He has raised more than £300,000 so far. Elan Môn Gilford, 17, from Llanfairpwll, Anglesey, a sportswoman and coach who has helped thousands of young people across Wales build confidence and skills through sport. Maya Ghazal, 17, from Perry Barr, Birmingham, a role model and spokesperson for young refugees and migrants across the UK. Jaylen Arnold, 16, from Lakeland, Florida, who tries to spread acceptance after being bullied for having Tourette's syndrome and autism. Faith Dickinson, 11, from Toronto, Canada, who launched the charity Cuddles for Cancer after her aunt was diagnosed with breast cancer. Amaan Iqbal Ibrahim, 15, from United Arab Emirates, who has supported 1,000 labourers to travel to work to earn money to support their families. Elsia Pop, 17, from Belize, who made it her mission to keep traditions of the Mayan people alive. Nikhiya Shamsher, 14, from Bangalore, India, who has helped provide thousands of underprivileged children with the facilities, funds and resources needed to build a better future through education. Mercy Ngulube, 18, from Cardiff, Wales, a social activist who is committed to equality for young people living with HIV. Suely, 18, from Scotland, who arrived in the UK when she was 14 and enthusiastically threw herself into social justice initiatives.